step 1 Preheat the oven to 350 degrees F. Line a 13-by-9-inch baking pan with foil, leaving a 2-inch overhang on the long sides of the pan. Spray the foil with cooking spray. step 2 Mix the melted butter into the finely ground vanilla wafers and add 2 Tablespoons of water. Mix well and press the crumbs onto the bottom of the prepared pan, forming a crust. Bake the crust for 20 minutes and allow to cool. step 3 Set aside 2 cups of the watermelon juice in a small bowl. In a large bowl, combine the remaining 3 cups of watermelon juice with the lemon zest, lemon juice, sugar and heavy cream. step 4 Sprinkle the gelatin over the reserved 2 cups of watermelon juice. Allow to sit for 2 minutes so that gelatin can dissolve and begin to absorb liquid, or "bloom." After the gelatin blooms, heat it in the microwave for 2 minutes on high, or heat gently in a small pot over low heat on the stove top, until the gelatin has completely melted into the juice and the liquid is smooth. step 6 Keep in the refrigerator until ready to serve. 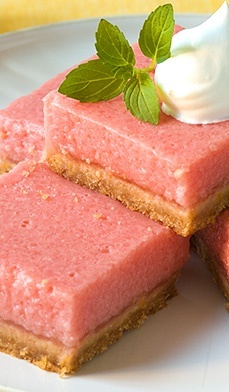 Before serving, cut the watermelon bars into squares. If desired, sprinkle each serving with confectioners' sugar or a dollop of whipped cream.